Here is another share for JUGS. 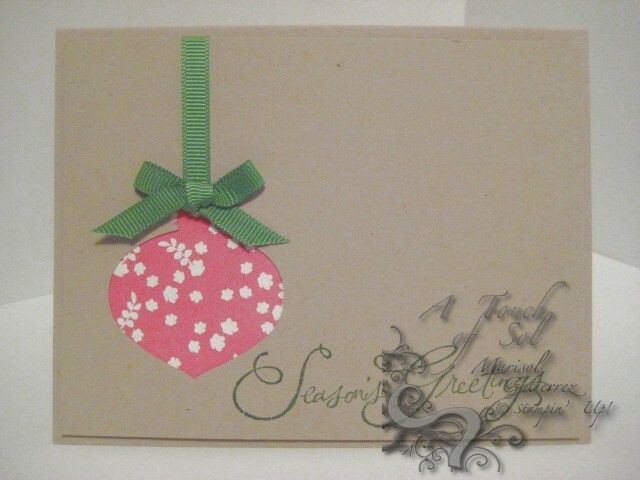 Here is another sweet and simple holiday card. I wasn't sure whether to add a sentiment to the lower left hand corner. I thought it might be too much. What do you think? Hola Amigas. I can't believe a week until Christmas. Where did the time go? Is everyone ready for the holidays? 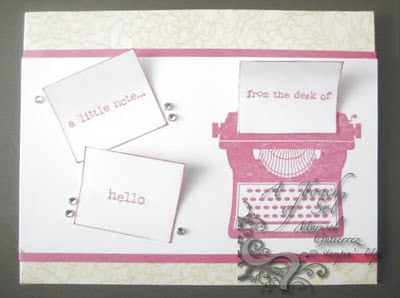 Today I am going to share an Occasions Mini 2012 Sneak Peek. 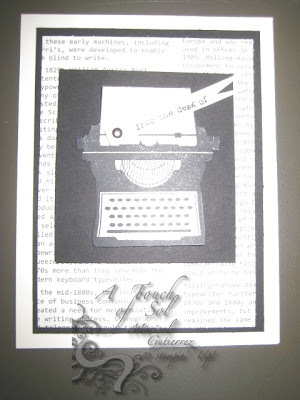 I would love for you to host a workshop with me. The Occassions Mini 2012 is GREAT! I am using the stamp set You're My Type. I made quite a few of these for gifts. If you are still looking for gifts for teachers, co-workers, etc. email me or call me and I can customize it just for you. This first one is very simple. I got a few suggestions from an SU Amiga. Thank you Sandra. This one is SUPER CUTE! I decided to give some dimension by having the paper 3D. Hola Amigas! December is HERE! I am HAPPY to say I am SUDSOL's December Featured Stamper. YEAH! 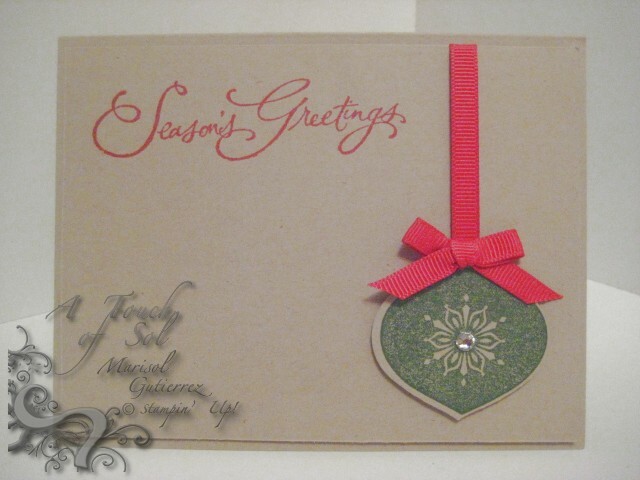 I also wanted to create something new not only for SUDSOL but for my upcoming workshop. 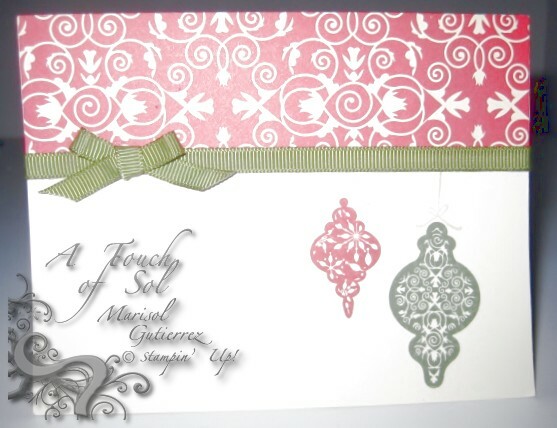 I made two simple but SUPER NICE cards using the ornament Punch. My first card I punched out the ornament and added DSP behind the open space. You can't tell in the pick but this layer is popped up with dimensionals. 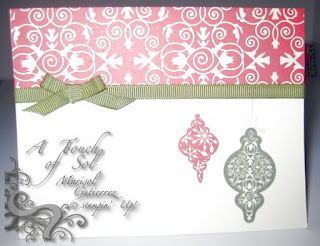 My second card uses the ornament punch out from the above card. COOL, huh? Recycling at its BEST! You can also use this color combo for Just Us Girls.